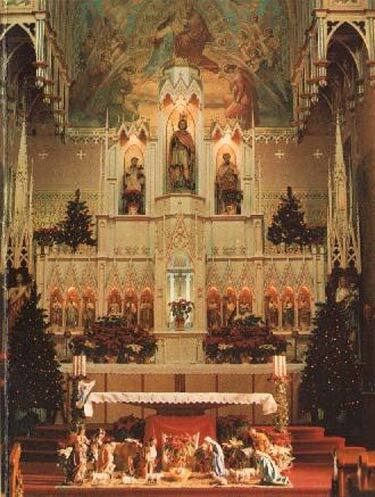 St. George Church, Shenandoah, Pennsylvania, Christmas, 1979. This church, built by immigrant coal miners in 1891, was torn down by the Diocese of Allentown in 2010. Almost as many countries arrogate the honour of having been the natal soil of St. Patrick, as made a similar claim with respect to Homer. Scotland, England, France, and Wales, each furnish their respective pretensions: but, whatever doubts may obscure his birthplace, all agree in stating that, as his name implies, he was of a patrician family. He was born about the year 372, and when only sixteen years of age, was carried off by pirates, who sold him into slavery in Ireland; where his master employed him as a swineherd on the well-known mountain of Sleamish, in the county of Antrim. Here he passed seven years, during which time he acquired a knowledge of the Irish language, and made himself acquainted with the manners, habits, and customs of the people. Escaping from captivity, and, after many adventures, reaching the Continent, he was successively ordained deacon, priest, and bishop: and then once more, with the authority of Pope Celestine, he returned to Ireland to preach the Gospel to its then heathen inhabitants. When baptizing an Irish chieftain, the venerable saint leaned heavily on his crozier, the steel-spiked point of which he had unwittingly placed on the great toe of the converted heathen. The pious chief, in his ignorance of Christian rites, believing this to be an essential part of the ceremony, bore the pain without flinching or murmur; though the blood flowed so freely from the wound, that the Irish named the place St. fhuil (stream of blood), now pronounced Struill, the name of a well-known place near Downpatrick. And here we are reminded of a very remarkable fact in connection with geographical appellations, that the footsteps of St. Patrick can be traced, almost from his cradle to his grave, by the names of places called after him. Thus, assuming his Scottish origin, he was born at Kilpatrick (the cell or church of Patrick), in Dumbartonshire. He resided for some time at Dalpatrick (the district or division of Patrick), in Lanarkshire; and visited Crag-phadrig (the rock of Patrick), near Inverness. He founded two churches, Kirkpatrick at Irongray, in Kireudbright; and Kirkpatrick at Fleming, in Dumfries: and ultimately sailed from Portpatrick, leaving behind him such an odour of sanctity, that among the most distinguished families of the Scottish aristocracy, Patrick has been a favourite name down to the present day. Arriving in England, he preached in Patterdale (Patrick’s dale), in Westmoreland: and founded the church of Kirkpatrick, in Durham. Visiting Wales, he walked over Sarn-badrig (Patrick’s causeway), which, now covered by the sea, forms a dangerous shoal in Carnarvon Bay: and departing for the Continent, sailed from Llan-badrig (the church of Patrick), in the island of Anglesea. Undertaking his mission to convert the Irish, he first landed at Innis-patrick (the island of Patrick), and next at Holmpatrick, on the opposite shore of the mainland, in the county of Dublin. Sailing northwards, he touched at the Isle of Man, sometimes since, also, called. Innis-patrick, where he founded another church of Kirkpatrick, near the town of Peel. Again landing on the coast of Ireland, in the county of Down, he converted and baptized the chieftain Dichu, on his own threshing-floor. The name of the parish of Saul, derived from Sabbal-patrick (the barn of Patrick), perpetuates the event. He then proceeded to Temple-patrick, in Antrim, and from thence to a lofty mountain in Mayo, ever since called Croagh-patrick. In the Galtee or Gaultie Mountains, situated between the counties of Cork and Tipperary, there are seven lakes, in one of which, called Lough Dilveen, it is said Saint Patrick, when banishing the snakes and toads from Ireland, chained a monster serpent, telling him to remain there till Monday. That St Patrick chained the serpent in Lough Dilveen, and that the serpent calls out to him every Monday morning, is firmly believed by the lower orders who live in the neighbourhood of the Lough. WWI came to an end by an armistice arranged to occur at the eleventh hour of the eleventh day of the eleventh month of 1918. The date and time, selected at a point in history when mens’ memories ran much longer, represented a compliment to St. Martin, patron saint of soldiers, and thus a tribute to the fighting men of both sides. The feast day of St. Martin, the Martinmas, had been for centuries a major landmark in the European calendar, a date on which leases expired, rents came due; and represented, in Northern Europe, a seasonal turning point after which cold weather and snow might be normally expected. St. Martin, the son of a Roman military tribune, was born at Sabaria, in Hungary, about 316. From his earliest infancy, he was remarkable for mildness of disposition; yet he was obliged to become a soldier, a profession most uncongenial to his natural character. After several years’ service, he retired into solitude, from whence he was withdrawn, by being elected bishop of Tours, in the year 374. The zeal and piety he displayed in this office were most exemplary. He converted the whole of his diocese to Christianity, overthrowing the ancient pagan temples, and erecting churches in their stead. 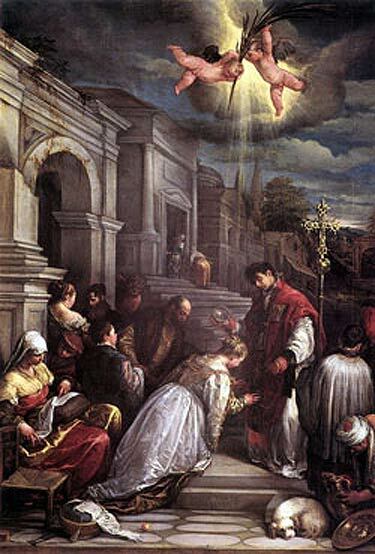 From the great success of his pious endeavours, Martin has been styled the Apostle of the Gauls; and, being the first confessor to whom the Latin Church offered public prayers, he is distinguished as the father of that church. In remembrance of his original profession, he is also frequently denominated the Soldier Saint. The principal legend, connected with St. Martin, forms the subject of our illustration, which represents the saint, when a soldier, dividing his cloak with a poor naked beggar, whom he found perishing with cold at the gate of Amiens. This cloak, being most miraculously preserved, long formed one of the holiest and most valued relics of France; when war was declared, it was carried before the French monarchs, as a sacred banner, and never failed to assure a certain victory. The oratory in which this cloak or cape—in French, chape—was preserved, acquired, in consequence, the name of chapelle, the person intrusted with its care being termed chapelain: and thus, according to Collin de Plancy, our English words chapel and chaplain are derived. The canons of St. Martin of Tours and St. Gratian had a lawsuit, for sixty years, about a sleeve of this cloak, each claiming it as their property. The Count Larochefoucalt, at last, put an end to the proceedings, by sacrilegiously committing the contested relic to the flames. The singularity of this distich, consists in its being palindromical—that is, the same, whether read backwards or forwards. Angis, the last word of the first line, when read backwards, forming signet, and the other words admitting of being reversed, in a similar manner. That veal and bacon is the man? With roasted geese and wine. A genial saint, like Martin, might naturally be expected to become popular in England; and there are no less than seven churches in London and Westminster, alone, dedicated to him. There is certainly more than a resemblance between the Vinalia of the Romans, and the Martinalia of the medieval period. Indeed, an old ecclesiastical calendar, quoted by Brand, expressly states under 11th November: ‘The Vinalia, a feast of the ancients, removed to this day. Bacchus in the figure of Martin.’ And thus, probably, it happened, that the beggars were taken from St. Martin, and placed under the protection of St. Giles; while the former became the patron saint of publicans, tavern-keepers, and other ‘dispensers of good eating and drinking. In the hall of the Vintners’ Company of London, paintings and statues of St. Martin and Bacchus reign amicably together side by side. On the inauguration, as lord mayor, of Sir Samuel Dashwood, an honoured vintner, in 1702, the company had a grand processional pageant, the most conspicuous figure in which was their patron saint, Martin, arrayed, cap-Ã -pie, in a magnificent suit of polished armour; wearing a costly scarlet cloak, and mounted on a richly plumed and caparisoned white charger: two esquires, in rich liveries, walking at each side. Twenty satyrs danced before him, beating tambours, and preceded by ten halberdiers, with rural music. Ten Roman lictors, wearing silver helmets, and carrying axes and fasces, gave an air of classical dignity to the procession, and, with the satyrs, sustained the bacchanalian idea of the affair. A multitude of beggars, ‘howling most lamentably,’ followed the warlike saint, till the procession stopped in St. Paul’s Churchyard. Then Martin, or his representative at least, drawing his sword, cut his rich scarlet cloak in many pieces, which he distributed among the beggars. This ceremony being duly and gravely performed, the lamentable howlings ceased, and the procession resumed its course to Guildhall, where Queen Anne graciously condescended to dine with the new lord mayor. 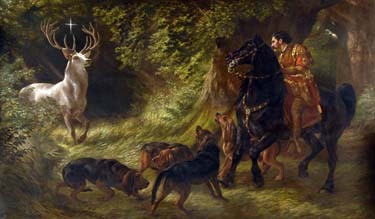 Samuel John Carter (1835-1892), Legend of St. Hubert, Private Collection (sold December 2007). Saint Hubertus was born (probably in Toulouse) about the year 656. He was the eldest son of Bertrand, Duke of Aquitaine. As a youth, Hubert was sent to the Neustrian court of Theuderic III at Paris, where his charm and agreeable address led to his investment with the dignity of “count of the palace”. Like many nobles of the time, Hubert was addicted to the chase. Meanwhile, the tyrannical conduct of Ebroin, mayor of the Neustrian palace, caused a general emigration of the nobles and others to the court of Austrasia at Metz. Hubert soon followed them and was warmly welcomed by Pepin of Herstal, mayor of the palace, who created him almost immediately grand-master of the household. About this time (682) Hubert married Floribanne, daughter of Dagobert, Count of Leuven.Their son Floribert of Liège would later become bishop of Liège, for bishoprics were all but accounted fiefs heritable in the great families of the Merovingian kingdoms. He nearly died at the age of 10 from “fever”. During Hubert’s religious vision, the Hirsch (German: deer) is said to have lectured Hubertus into holding animals in higher regard and having compassion for them as God’s creatures with a value in their own right. For example, the hunter ought to only shoot when a humane, clean and quick kill is assured. He ought shoot only old stags past their prime breeding years and to relinquish a much anticipated shot on a trophy to instead euthanize a sick or injured animal that might appear on the scene. Further, one ought never shoot a female with young in tow to assure the young deer have a mother to guide them to food during the winter. Such is the legacy of Hubert who still today is taught and held in high regard in the extensive and rigorous German and Austrian hunter education courses. The legacy is also followed by the French chasse à courre masters, huntsmen and followers, who hunt deer, boar and roe on horseback and are the last direct heirs of Saint Hubert in Europe. Chasse à courre is currently enjoying a revival in France. The Hunts apply a specific set of ethics, rituals, rules and tactics dating back to the early Middle-Ages. Saint Hubert is venerated every year by the Hunts in formal ceremonies. the Archives of Never Yet Melted in the 'Hagiography' Category.